A tale from France explains why the Robin has a red breast, and it all goes back to a cold winter night so many years ago in a small town called Bethlehem. Most of you have heard the story about the birth of the Christ Child and how Mary wrapped the baby in swaddling clothes and laid Him in the manger. We can only imagine the activity as excited shepherds came running into the stable from nearby fields and angels flew overhead singing about the birth of the child. There were likely local citizens who hear the news and who stopped by to visit and see the event for themselves. 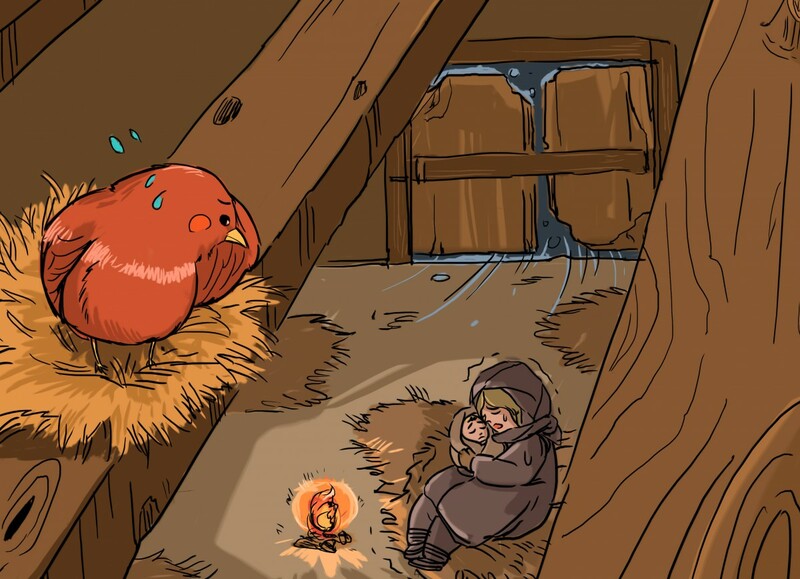 But, the story about the Robin took place after the visitors were gone and the stable was quiet. The cold winter wind blew through cracks in the walls of the old stable, and Mary sat holding her child in her arms. Earlier in the evening, a small fire by her side kept the chill off her and the baby. Now, the glow of the fire along with its heat faded. Only a small pile of glowing embers remained. Joseph had left the barn to look for firewood to stoke the fire and provide heat for his family. He wasn't certain how long they would have to remain in Bethlehem before the census would be completed and Mary and the Baby would be strong enough to travel. From time to time, Mary would blow on the dieing embers and cause them to glow, bringing a small amount of warmth to her and the baby. It was hard for her to bend over far enough to blow on the fire without smoke blowing on her child. So, she looked to the animals for help. "Ox," called Mary. "You are big and strong. Would you please blow on these embers with your breath? I know you could get our fire to burn once more." But the ox was tired and fast asleep. He had been walking all day tied to a grinding wheel, turning the giant stone to grind grain into flour and was worn out. He had not even had a full meal before bedtime, since the baby had been laid in his manger. Now, he could not hear Mary's gentle voice and continued his snoring. "Horse?" called Mary, "You are tall and strong. You could easily lower your long neck and blow on the coals to rekindle our fire. Won't you please help me?" But the horse had been pulling heavy carts over the city streets all day and was tired. He was lost in his dreams of fresh hay and clover and did not hear Mary's request. "Donkey?" asked Mary. "You were so wonderful to carry me on your back on our way to Bethlehem. Do you have enough strength left to blow on the coals and start our fire?" But, the donkey was fast asleep, worn out from the long journey and could not hear her. Mary held the baby closer to her and again tried to bend over to blow on the embers and bring warmth to the stable. She did not see a small brown bird fly down from the rafters to land next to the embers. The bird was a little robin. The robin had watched and heard everything from a warm nest near the ceiling and wanted to help the mother and child. He stood close to the coals and began to flap his wings back and forth. He fanned the embers, causing them to begin to glow. Faster and faster he flapped causing the embers to turn from a near black to a red and orange. Then, the embers began to flame, and the robin's brown chest reflected the red glow of the fire. Mary felt the warmth and was grateful. She turned to the robin and said, "Wonderful bird, thank you for the work you have done to warm my child and myself. From now on, you will always wear a breast of red as a sign of your kind and warm heart." From that day forward, every Robin you see has a red breast, and that is one story of how it happened.